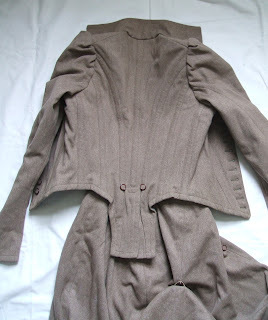 TRUE VINTAGE WOOL SIDESADDLE RIDING SKIRT AND JACKET, RARE. C1880-1910. 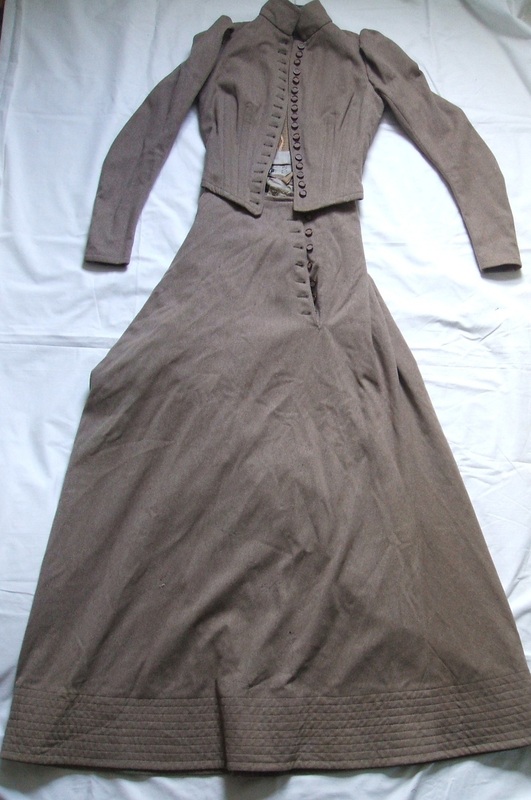 across underarm at front: 15"
waist to hem of skirt: 43"
top of sleeve to cuff: 25"
shoulder seam to shoulder seam: 11.5"
back of neck seam to approximate waist of Top: 14/15"
Here is a lovely early antique riding outfit i believe was made for riding sidesaddle, Skirt and Top made from tan/taupe wool. 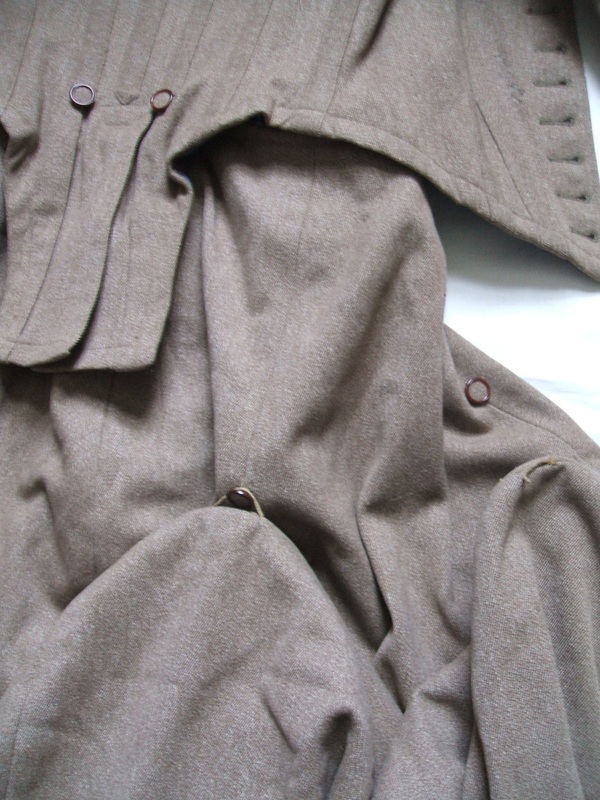 There are 2 bulges on the right of the skirt about midway down, each having a button loop (one loop is torn) and a corresponding button to lift the bulges up (see photos). At first i thought it was for a bustle but then realized it was toward the side of the Skirt. 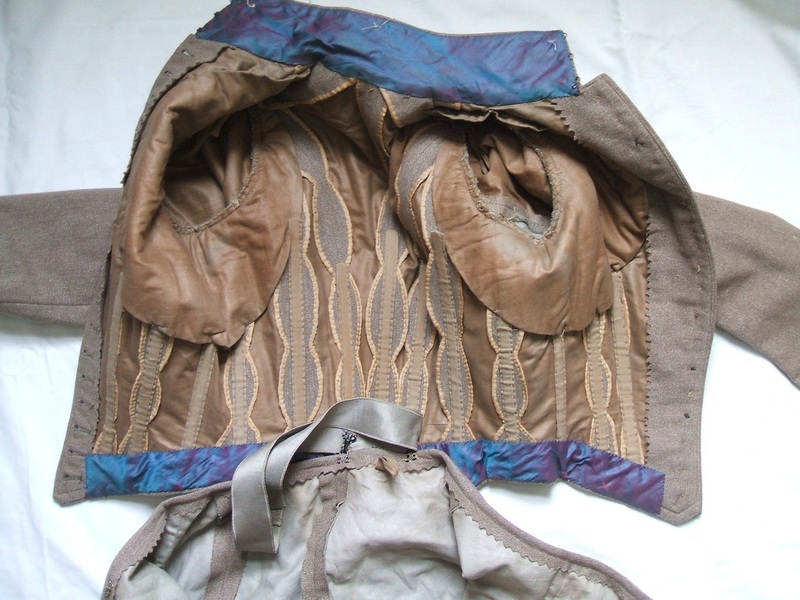 Then i found similar pieces described as sidesaddle riding skirts which was a complicated style that helped with riding sidesaddle. It is both machine and hand sewn. There is an interesting array of stays in the top piece as shown.. 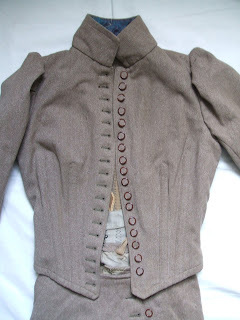 The jacket has slight puffy sleeves which taper to a simple unadorned cuff and a stylized tail at the back. The skirt has a nice weight at the hem with banded stitches. The buttons are all covered buttons with a tortoise type banded border; one button might be missing on the bottom row of the Top. 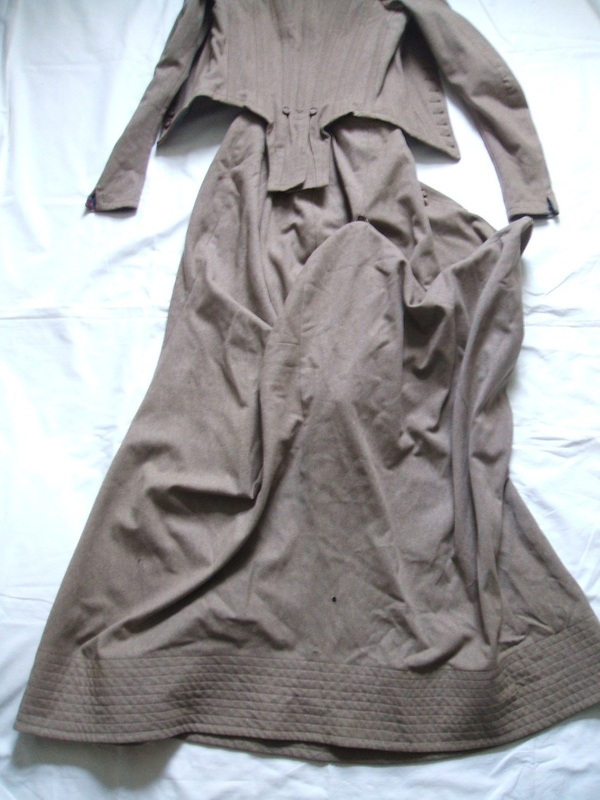 The Skirt is full length and has two metal loops on the back which hook onto hooks at back of the Jacket. 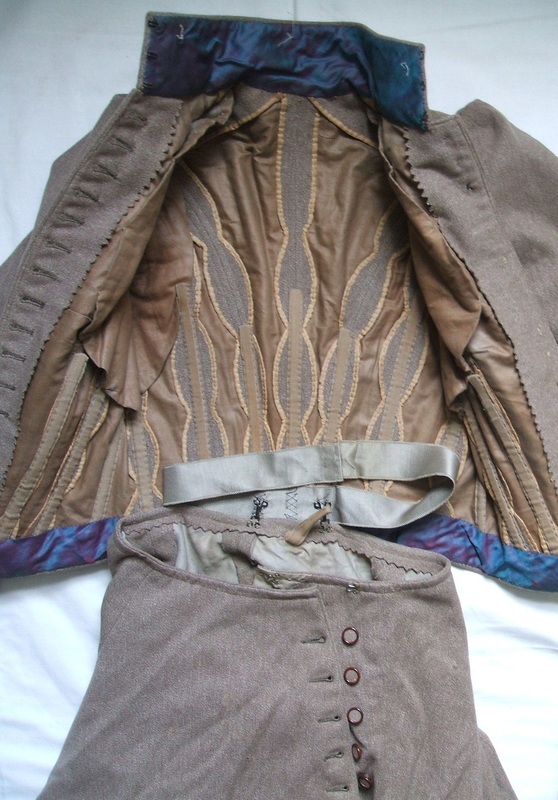 The front buttons on the Skirt are off set to the left and inside that placket there is a pocket. Extremely well made! Skirt has one hole in the lower back (the largest hole, visible in photo 8) and several lesser holes and slight wear areas at the lower front of the skirt as shown in detail photo (last photo). Top appears to be in great shape. With the thick lining around the arm holes at the Top plus the stays and finished seams plus the thick wide hem, this piece has a good heft. Gorgeous Riding Habit from the 1890's. Wow! <3 I'm not an avid costumer, but there's something I might want to replicate some day. Gorgeous inside detail. Thanks for posting things with so many construction details.